Modern design is all about simplicity and streamlined efficiency, both in terms of aesthetics and functionality. Many “storage smart” and “space saving” designs have a modern feel to them, in large part because they emphasize utility and convenience in a way that more ornate, traditional designs don’t. 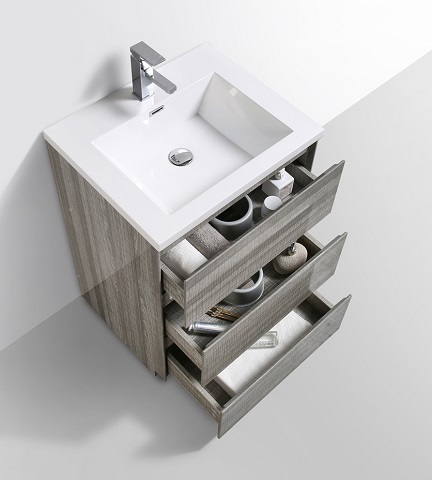 But while storage-packed modern bathroom vanities have become a staple of small bathrooms, modern design elements can revolutionize larger spaces as well. The benefit of having better storage in a small bathroom is obvious: when you don’t have a lot of room to work with in the first place, you want to make the most of it however you can. 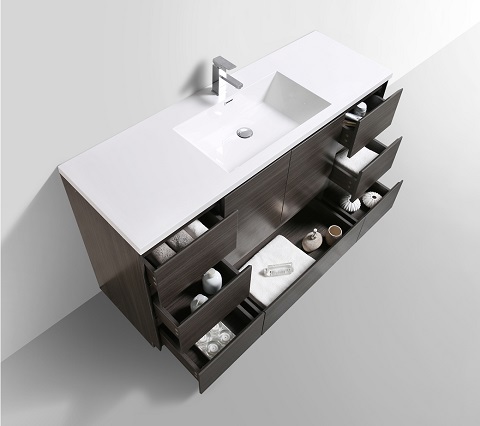 Modern bathroom vanities do that by dividing up the traditional large, single cabinet into full-extension drawers. 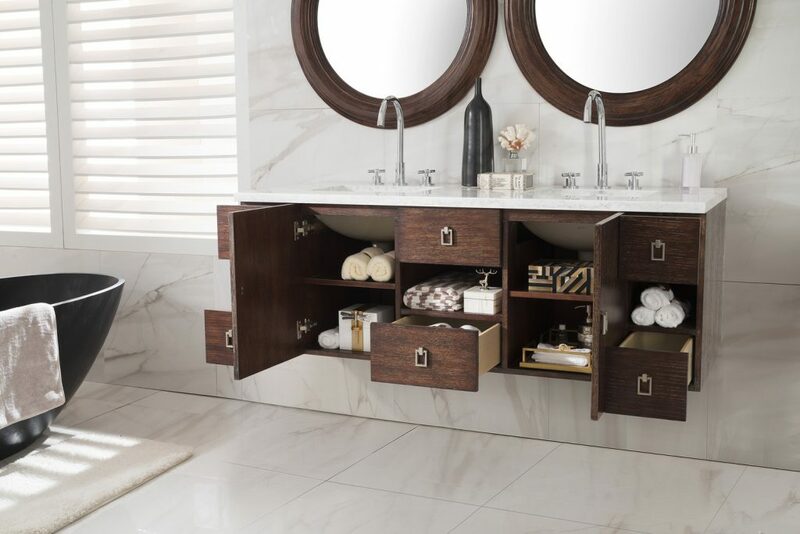 Not only are these drawers better suited to storing the kinds of things you typically keep in the bathroom, but having them on full-extension glides means you can pull them all the way out and easily access everything inside – which means you’re making use of all the space inside the vanity. For the smallest bathrooms, narrow, floor-mounted vanities made up of drawers from top to bottom are the best way to maximize your room’s storage potential. But if you have a little more space to spare, wider wall-mounted vanities offer a similar amount of storage space, but have a lighter, more streamlined feel. They also give you more control over an oft-overlooked aspect of your vanity: the height. Most freestanding vanities clock in somewhere between 30″-36″ tall, but that six inch range can make a bigger difference than you might think – especially if you’re very short or tall. Wall mounted vanities guarantee not only a comfortable sink height, but that all the stuff in your drawers is at a comfortable, accessible spot, too. 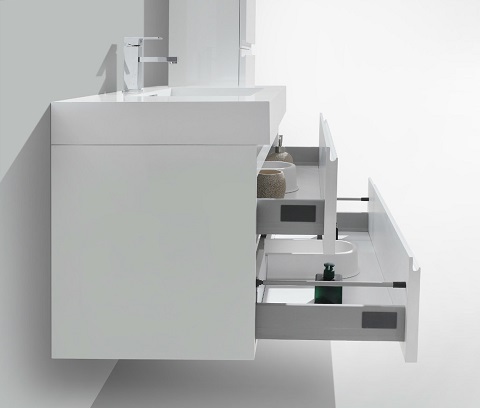 A big concern for modern bathroom vanities of any size is how to accommodate the sink and plumbing. Most traditional vanities simply don’t bother, filling a significant chunk of the vanity cabinet with exposed pipes. 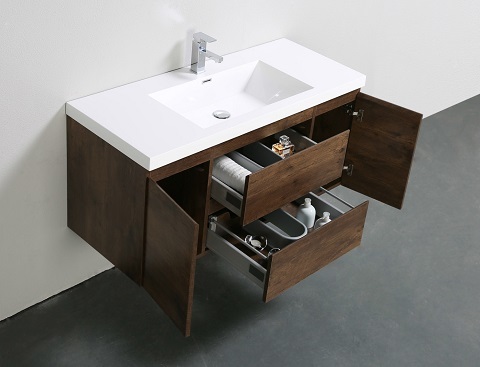 Modern vanities take a few different approaches. The most common is to minimize the sink and plumbing (usually with a shallow sink integrated into a thick counter, combined with L- rather than U-shaped plumbing), and then create a U-shaped drawer to compensate for the plumbing. While this makes for some slightly odd-looking drawers, it maximizes storage near the sink while minimizing lost space. The other trick – and one you typically see on larger modern bathroom vanities – is to do more-or-less what traditional ones do: quarantine the sink and plumbing above and inside a cabinet. The difference is, the cabinets on modern bathroom vanities are almost always smaller and more segmented. Instead of one huge cabinet, think one maybe half or a quarter the size, complete with a shelf. This setup is ideal for storing items that are taller (like hair spray bottles or cleaning products) that can fit around your vanity’s plumbing without too much wasted space. Making the centralized cabinet smaller has another nice side effect: there’s more room for drawers. Most modern bathroom vanities in this style have a row of drawers on at least one side of the cabinet, and many of the freestanding ones will add a drawer beneath the cabinet as well, again to make use of all the space available. Modern vanities also almost always have at least one functioning drawer right below counter level, which is a convenience you might not appreciate unless you’ve had a vanity with a faux drawer plate barring that oh-so-precious, easily-accessible real estate. Of course, if you have a very large bathroom (and a very large bathroom vanity to go with it), you might not be overly concerned about a little bit of wasted space here and there. After all, you only have so much stuff you need to store, even in a heavily trafficked master bathroom. 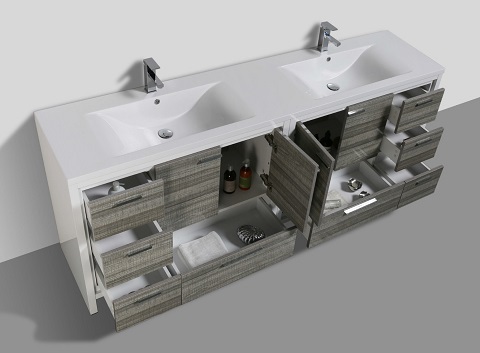 That said, what modern bathroom vanities bring to larger spaces is no less important: convenience. 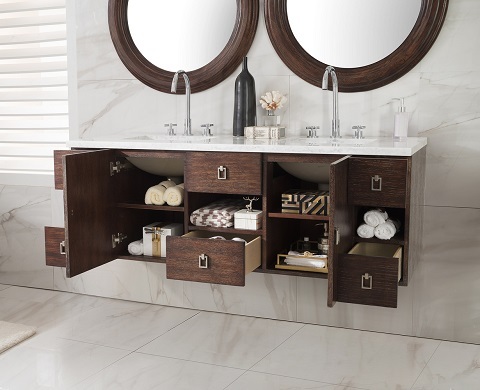 While a wall-to-wall traditional vanity might technically be able to fit all your stuff, a modern one will keep your stuff in a place where it’s easily accessible and well-organized. Instead of having to hunt for your makeup bag or shaving kit in a big, open cabinet, you can keep all your things out, sorted, and at waist height and in arms reach – something you won’t get from almost any traditional vanity. Doing away with traditional large cabinets in favor of intuitive modern drawers isn’t just about saving space, but about making your space more usable – no matter how big or small your bathroom! This entry was posted in Bathroom, Bathroom Vanities, Decorating Ideas and Tips, Latest Trends and tagged large bathroom vanities, master bathroom ideas, Modern Bathroom Vanities, Small bathroom vanities, storage smart bathroom vanities, Wall mounted bathroom vanities. Four Simple Ways to Build A Nautical Themed Bedroom – And Not Just For Kids!